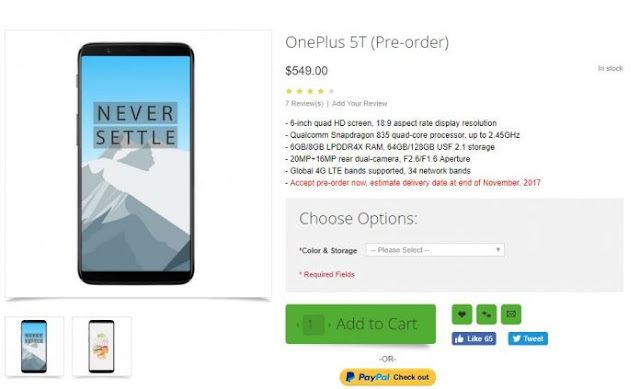 OnePlus 5T Pre-Order: OnePlus has been very consistent with the leaks as many features of the smartphone were leaked beforehand. OnePlus 5T is one such phone which was leaked before it is released. The smartphone price, specifications were leaked and on the same day the smartphone is up for pre-order on Chinese e-commerce website Oppomart for $549 and has two variants which you can see in the picture above. With this news, many people are registering with the e-commerce website before the smartphone was released. One the same day of OnePlus 5T specifications leak via an Antutu screenshot showed up that shows much of the hardware as well as Android Oreo out-of-the-box, the pre-order also showed up. It is widely expected that the smartphone will be unveiled sometime in November. The listing of OP5T on OppoMart reveals that it has a 6-inch Optic AMOLED display that is tucked under 2.5D Corning Gorilla Glass. It carries support for an FHD+ resolution of 1080 x 2160 pixels and an aspect ratio of 18:9. The smartphone is driven by Snapdragon 835 chipset. It comes in 6 GB and 8 GB RAM LPDDR4X options and two UFS 2.1 storage models like 64 GB and 128 GB. It includes a 3,450mAh battery that is equipped with 5V/4A Dash Charging. The dual camera present on the rear panel includes a 20-megapixel f/1.7 aperture Sony IMX398 sensor and 16-megapixel f/2.6 aperture Sony IMX350. It has a selfie snapper of 16-megapixel f/1.6 aperture Sony IMX371 sensor. It is preloaded with Android Nougat that is customized with OxygenOS and the listing suggests that it will be receiving Android Oreo. In the above image, the fingerprint reader is not present at the front as it features a large display. Hence, the biometric recognition feature is speculated to be placed on the rear panel of OP5T. The above specifications reveal that the chipset, RAM, storage, dual rear cameras and selfie camera of OP5T are same as that of OnePlus 5. However, the major change on the OP5T is the inclusion of a full-screen display and a bigger battery. Since it features a larger display, it measures 157 x 75.4 x 7.25mm and weighs 164 grams. On the other hand, the dimensions of OnePlus 5 are 154.2 x 74.1 x 7.3mm and its weight is 153 grams. The 64 GB OnePlus 5T has a pricing of $549 and the 128 GB variant is listed with a price tag of $649 on Oppomart. The listing shows the handset in a single color option of Grey. The Chinese retailer is accepting the pre-orders of OP5T, but the shipments are expected to begin at the end of November. The 64 GB and 128 GB models of OnePlus 5 are respectively priced at $479 and $539. Well, both the models have gone out of stock on the official OnePlus store. It appears that the company may discontinue the OP5 with the arrival of OnePlus 5T.